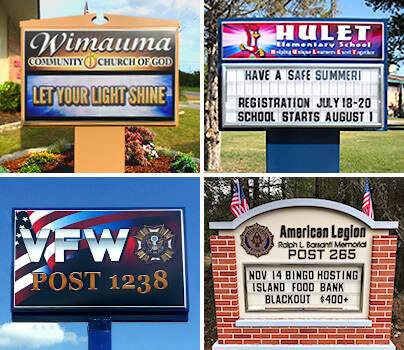 Church signs can be a very powerful marketing tool and in fact, many church leaders have noticed an increase in attendance after putting up their signs. Looking for ways to improve your marketing with signage? Wondering how to use your church sign as a marketing tool? For a bit of inspiration, check out these ideas. Church signs alert passersby about your church. When choosing a sign, make sure that you think about how the sign can boost your visibility. If your building is nondescript, a simple sign can let the world know that a faith community is inside. Similarly, if your church is tucked away behind other buildings, you may want a very tall sign that can be seen over buildings and from down the block. In that same vein, a backlit sign or an LED sign can make sure that people can easily find your church even when it's dark outside. Simply letting people know about your presence is often the first step in marketing. Once you've let people know that you're there, you need to tell them a little bit about yourself, and your church sign can help. Ideally, your sign should reflect your church's unique personality. If your church is young and fun, your logo and the colors you use on your sign should reflect that vibe. You may want to bring home the idea with cutting-edge technology. On the other hand, if your church is more traditional, you may want to choose a sign with elements that showcase that particular sensibility and you may also want to choose a very traditional masonry-inspired frame. Regardless of the customizations you choose, people should be able to look at your sign and feel like they know your church just a bit better. When you're trying to reach people with a message, repetition is key. You may want to consider integrating the messages on your church sign with your social media posts. There are all kinds of fun and creative ways to do this. For instance, with a changeable letter sign, you can ask a question. Then, you can let readers know that they need to find you on social media to get the answer. That approach helps you boost your social media following. On the flip side, you can also invite people to post on social media using your hashtag. Then, you can broadcast those posts on your LED church sign. If you take this route, you can set up the system so that you are able to manually approve every post before it gets shared on your sign. Your sign can also be a great place to let the world know how your church is carrying out the mission of Jesus Christ in the world. If you're feeding the hungry, sharing the word of God, gathering volunteers for a mission trip, collecting donations, or doing countless other things, you can spread information about those events on your sign. With an LED sign, you can even put up short video clips of people from your church helping the community. Your church sign can work as a marketing tool to let the outside world know more about your church, but don't forget the important role your sign can also play to improve communication within your community. If you share a message inside the church, you may also want to consider posting that same message on your church sign. To give you an example, let's say that you tell the congregation about a special event like a new Bible study group. Although they heard the message at the end of service, it may slip their mind. However, if you also promote that event on your outdoor church sign, the congregation gets a reminder and they may be more likely to attend. The timing of your messages can also be important. To enhance your marketing efforts, you may want to time your messages strategically. If you have a changeable letter sign, you may want to put up seasonal messages. For instance, you may want to let people know about special holiday services, you could remind people that church is open between Christmas and Easter, or you may want to put up messages that celebrate springtime or spread hope during winter. With an LED church sign, you can get even more targeted with the timing of your messages because you can change the message multiple times during the day. If you want to communicate with parents driving to and from school, you may want messages about parenting support groups or youth groups to be broadcast during those hours. Similarly, you may want to schedule special messages designed to reach lonely people driving past on their way home from work. Most importantly, when you're marketing with your church sign, you should focus on having a bit of fun. Consider putting up comical or witty messages. They can brighten the day of your congregation, make passersby chuckle, and hopefully bring new families through your door. Alternatively, you can put up pithy messages that start conversations. If you prompt your congregation to think about key spiritual topics, they are likely to deepen their own faith. Similarly, if you put up messages that make other people in your community think, they may be more inclined to want to visit your church to get answers. At Stewart Signs, we provide signs for churches as well as for civic organizations, municipalities, schools, and nonprofits. To learn more, contact us today. We can help you find the right sign for your faith community.